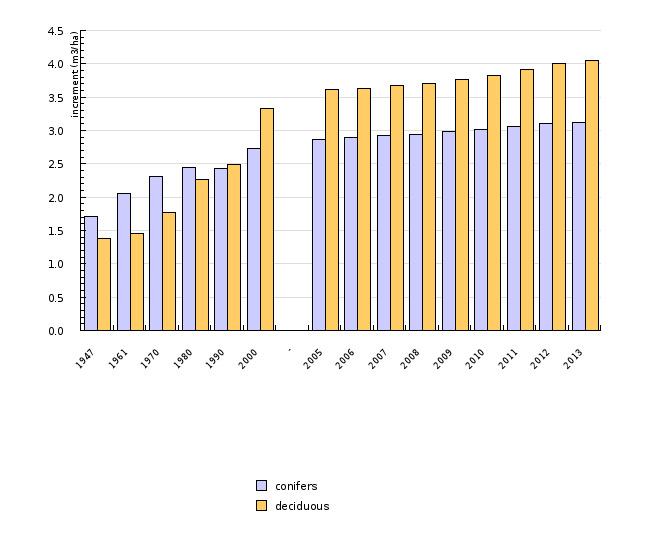 For many decades, growing stock per hectare and annual gross increment have been constantly rising in Slovenia. Over the past 60 years, they increased by more than 120%. The amount of felling depends not only on natural conditions but also on socio-economic factors, which is why it has been changing through the decades and today amounts to 50% of the annual increment. This indicator shows the state of forests in view of growing stock, increment and fellings, which all reflect forest management. The data on growing stock and increment are presented for the period 1947–2010, while the data on fellings are presented for the period 1991–2013. Growing stock: Volume of all living trees with bark that have more than a certain diameter (X cm) at breast height (or above any irregularities in the trunk). This includes the stem from ground level or stump height up to a given top diameter (Y cm), and may also include branches above the minimum diameter (W cm). In Slovenia, the diameter threshold (X) is 10 centimetres, so all trees thicker than 10 cm are counted as growing stock. The minimum diameter (Y) is 5 centimetres. Branches are not included as growing stock. Increment: Average annual volume of incremental growth over the reference period with tree diameter measured at breast height (or above any irregularities in the trunk). This includes the increment of trees that have been felled during the reference period. Fellings: Average annual volume of all trees, living or dead, measured overbark that are felled during the given reference period, including the volume of trees or parts of trees that are not removed from the forest. To increase growing stock and increment in Slovenian forests through moderate and selective accumulation of increment. To increase felling in forests within the allowable volume. The planned allowable felling in forests shall reach 75% of increment at the national level. Throughout history, growing stock has been a key indicator of the state of forests. Information on growing stock is indispensable for understanding the dynamics and production capacity of forests. It is the basis for the development of national policy and strategy for the sustainable use of forest resources. Together, growing stock, increment, felling, forest area and allowable felling constitute a basic set of indicators used to monitor forest dynamics. In addition, these indicators are the basis for conducting estimates of biomass and carbon contained or stored within a certain forest. For this reason, information pertaining to how these indicators change over time is extremely important. We are pleased to note that from the viewpoint of growing stock and increment, Slovenian forests have been improving for decades. This is mainly due to systematic forest management, and partly a consequence of changes in the methodology of determining what constitutes growing stock (ocular estimation – control sample method). Increment percentages in Slovenian forests are kept at a steady level compared to the growing stock. The allowable cut, whose implementation was only 75% in the last decade, also follows this trend. According to reports by the Slovenia Forest Service for 2014, growing stock amounts to 289 m3/ha, increment is 7.17 m3/ha and annual allowable felling volume is 3,923,995 m3. 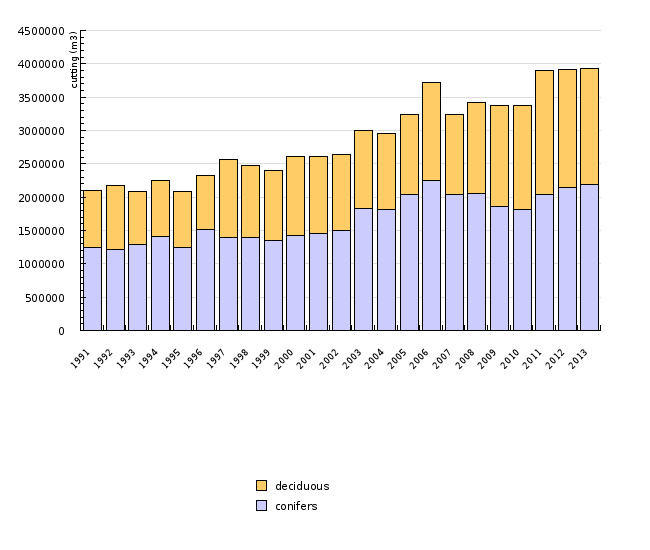 Over the past 60 years, growing stock per hectare and increment have increased by 130%, while the volume of felling fluctuated between 2 million m3 (in 1991) and almost 4 million m3 (in 2013), which represented between 100% of increment in the 1950s and less than 40% in the beginning of the 1990s. Today, the volume of felling amounts to approximately 50% of increment. The reason for such accumulation of growing stock in Slovenian forests and such increment fluctuation is effective forest management. When speaking of growing stock, increment or fellings, one must also indicate the structure by tree species and broader categories (coniferous and deciduous trees). The ratio between coniferous and deciduous trees changes constantly and was increasing in favour of coniferous trees until 1961, when the percentage of conifers was 58%. After 1961, the percentage of conifers began to decrease and, in 2000, it dropped under 50%. Fellings reflect the economic and social use of forest resources in the national economy and the dependent local communities. They contribute to the monitoring of the sustainable use of forest resources by comparing actual wood removal with sustainable wood removal. According to the FAO Global Forest Assessment Study, the growing stock and increment in Slovenian forests in 2005 were much larger than in the rest of Europe. In Slovenia, as well as in Europe (the EU-27), trends of increasing growing stock and increment have been observed. In 1990, the fellings in Europe were reported to be 378,651,600 m3, in 2000 443,649,000 m3 and in 2005 441,995,300 m3. A slightly positive trend with fluctuations between individual years is noted in the majority of European countries, the main reasons being the increase in forest areas and the increase in increment. Fellings are strongly influenced by the market, which explains the significant variation between individual years. The ratio between fellings and increment is low and constant. In Slovenia, we expect development to follow the guidelines stated in the National Forest Programme. Further planned forest management will allow Slovenia to get closer and closer to the optimal average growing stock, which is 320–330 m3/ha. In order to achieve that, further moderate and selective accumulation of increment will be required. Therefore, we anticipate that development will grow in the direction leading to the attainment of this qualitative goal. How was the indicator measured? To calculate the growing stock and increment volume at the level of individual forest management units, data acquired at permanent sample plots (major part) and by means of ocular assessment (minor part) are used. In the protective forests and forests with a special purpose where interventions are not allowed, mostly the ocular assessment method is used. In all other types of forests (multi-purpose forests and forests with a special purpose where interventions are allowed), the abovementioned indicators are measured based on permanent sample plots that are distributed on the surface into a systematic grid with different degrees of density (from 200x200 m onwards). In each plot, the stand type is determined which serves as a basis for the stratification. Average values are calculated for each level of thickness (5 cm). The basis for determining the increment are two consecutive measurements within a given period. The manner of keeping an inventory of fellings is determined by the Regulation on the forest management and silviculture plans. The basis for keeping an inventory of fellings are the fieldwork data sheets for fellings where the trees intended for fellings are recorded according to the tree types, thickness levels, types and causes of fellings, the follow-up of works related to the decisions in the administrative procedure according to Articles 17 and 19 of the Act on Forests, and the inventory of unauthorised fellings. For each previous year, the data on fellings at the level of sections (E4 form), management class, ownership and forest management unit (in the EVP table) are entered into at least one copy of the Forest Unit Management Plan by the end of February. The 2007 values are lower because a new way of taking inventory of felled trees was introduced. For forests where growing stock and increment are determined by means of permanent sample plots (500 m2), the fellings and the quantity of unexploited trees for the entire management period are independently evaluated based on the measurements taken at sample plots (Veselič 2005). • description of the data source: Data and analyses in the report were calculated based on reports from individual countries. o Veselič, Ž., Matijašić, D., 2002. Forest Management Unit Plans for the period 2001-2010, Journal of Forestry, Volume 60, Issue 10 (Dec. 2002), pp. 461-489.
o Slovenian national forest development programme, Official Gazette of the Republic of Slovenia, no. 14/1996 of 8-3-1996.
o Rules on the forest management and silviculture plans, Official Gazette of the Republic of Slovenia, no. 5/1998 of 23-1-1998, pp. 256 – 282.
o Rules amending the Rules on forest management and silviculture plans, Official Gazette of the Republic of Slovenia, no. 70/2006 of 6-7-2006, pp. 7293-7298.
o National Environmental Action Plan (NEAP), Official Gazette of the Republic of Slovenia, no.. 83-3953/1999, p. 12765.
o Global Forest Resources Assessment 2005, UN FAO, Department of Forestry, 2006.
o Global Forest Resources Assessment 2000, UN FAO, Department of Forestry, 2001.